Taylor Sargent during a dress rehearsal Monday. 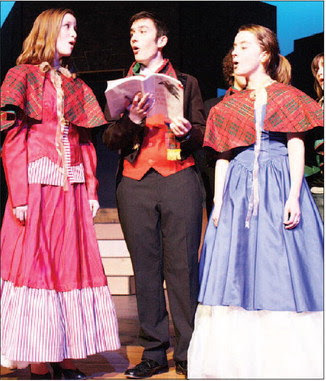 DERRY -- After more than two months of rigorous practice, the Pinkerton Players present their take on “A Christmas Carol” this weekend, with opening night tonight. Joel Kasnetz left, and Spencer Benson. While the school’s theater group performs a fall play each year, “A Christmas Carol” only comes around every fifth year, said director Ann West. “I try to make sure that we have the opportunity for all students to do this, but only every fifth year so each class has one shot at it,” said West, who has been directing the Pinkerton Players for 52 years. But after a demanding few months of practice, Scott said he expects great things from the show. And with senior Joel Kasnetz leading the group as Scrooge, West said this year’s cast offers something special. “Every year is wonderful, but this is a very strong cast, and Scrooge is particularly strong this year,” West said Monday. “A Christmas Carol”opens at 7 p.m. tonight at the Stockbridge Theater at Pinkerton Academy, with evening shows continuing on Friday and Saturday. A Sunday matinee will be held at 2:30 p.m. Tickets are $8 for adults and $6 for seniors and Pinkerton Academy students and faculty.